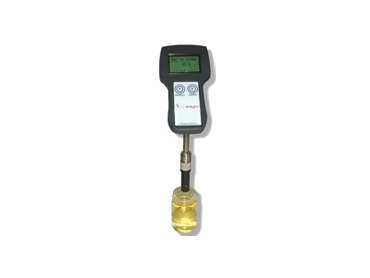 Now available from John Morris Scientific , the new Stanhope-Seta hand-held conductivity meter has been designed to measure the electrical conductivity of distillate fuels such as Jet-A1 to ASTM D2624 or IP 274. These conductivity meters are provided in an industry standard ATEX approved polyamide housing, with a built in Lithium Ion rechargeable battery system. The conductivity sensor is constructed of two 316SS coaxial electrode sensors, and has a measurement range of 0 to 2000 picosiemens/meter (pS/M), although it is optimized and is usually used in the 0 to 500 pS/M range. This hand-held conductivity meter has a simple to use menu system and allows users to store up to 10 sample data points internally along with the temperature date and time. This data can be viewed on the screen or transferred to a computer via USB. Software is also available for data analysis plotting and archiving.